Oscars night is one of my favorites of the award show season just for the pure glitz and glamour of the entire event. The celebrities look gorgeous and are probably really hungry… while I’m in sweats and munching on this AMAZING copycat Moose Munch and sipping on my Red Carpet cocktail debating on which dress I would wear if I were ever in that situation. Read – I will never be, but if I was, I’m pretty sure I’d just take a tumble like my girl J-Law.. probably much less elegantly too. 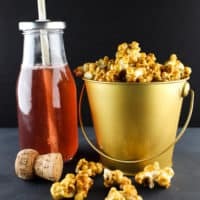 Popcorn and the movies are synonymous with one another, but I felt like it needed to be just as fancy as the night itself and what’s more fancy than that luscious caramel.. Nothing. Maybe chocolate.. which is why that’s thrown on there too. Like… that caramel and peanuts… and chocolate together. I can’t stop eating it. If I knew it was so easy to make, I would’ve been doing this years ago. There were so many cravings for caramel corn and Moose Munch that were completely unnecessary when I JUST COULD’VE MADE IT. It’ll all be okay from now on. Champagne was the obvious choice for the night. The red carpet needed to be honored beyond the multiple hours of interviews going on right now. Add a little pomegranate juice and homemade sour mix and bam. Perfect Oscar night drink. I probably could’ve been a little more creative with the name, but I have the Oscars to watch. If you hear excessive cheering when (fingers crossed) Leo wins the Oscar finally, that’s me. For the Red Carpet Cocktail, combine 1.5 oz pomegranate juice, 1.5 oz sour mix, and 5 oz of champagne together. Enjoy! 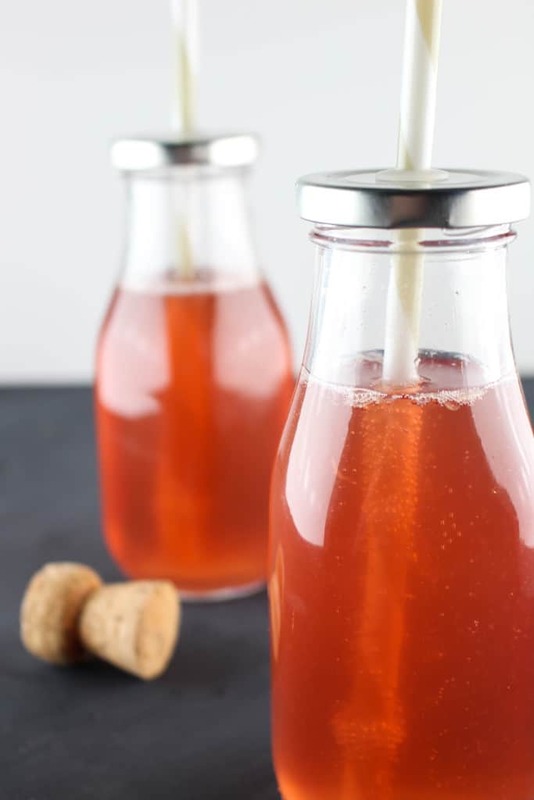 Makes around 1.75 cups of sour mix. An easy copycat Moose Munch perfect for any occasion. Make popcorn according to the bag. If you're making from kernels, heat oil over medium heat in a large pan, throw a few kernels in, and put the lid on. Once those pop, quickly put in the rest of the kernels and cover. Slightly move over heat while popping to stop the kernels from burning. Take off heat once you hear 2-3 seconds between pops. Put popcorn and nuts over parchment paper or silicon mat for a baking sheet. Heat brown sugar, corn syrup, and butter together in a medium sauce pan over medium heat. Constantly stir until the caramel boils. Let boil 2 minutes without stirring. Stir in baking soda. 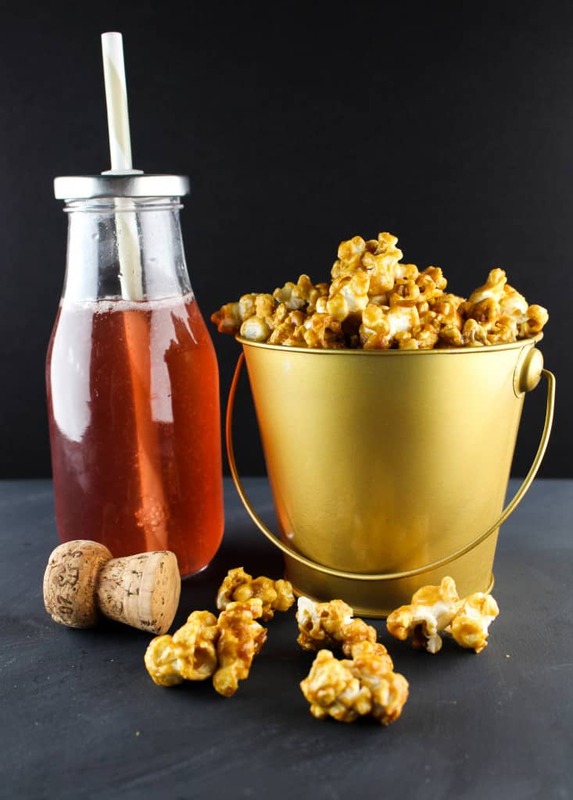 Immediately pour caramel over popcorn and nut mixture and mix until well coated. Put in oven for 45 minutes stirring every 15 minutes to ensure it's all coated. Let sit in baking sheet on counter until set. If you'd like chocolate chips, heat chips in a microwave proof bowl at 30 second intervals and stir until melted or use a double boiler to melt. 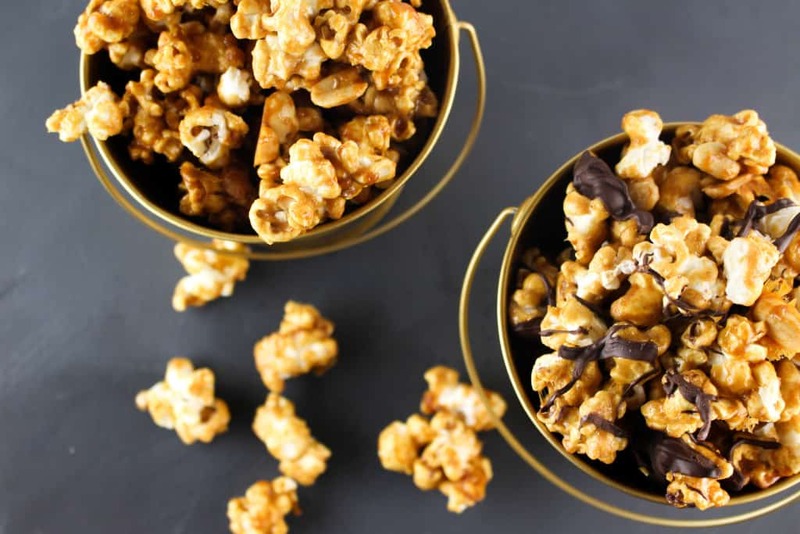 Use a fork to drizzle over popcorn mixture and let set. Enjoy!